SKU: 3242. Categories: Theological, Devotional. Widely acknowledged to be one of today’s foremost hymn-writers, this volume brings together all his hymns and translations. It includes 160 hymns, some never before published, in its 196 pages. This collection of hymns was a sell-out at the 1999 Aberystwyth Conference and it is easy to see why. 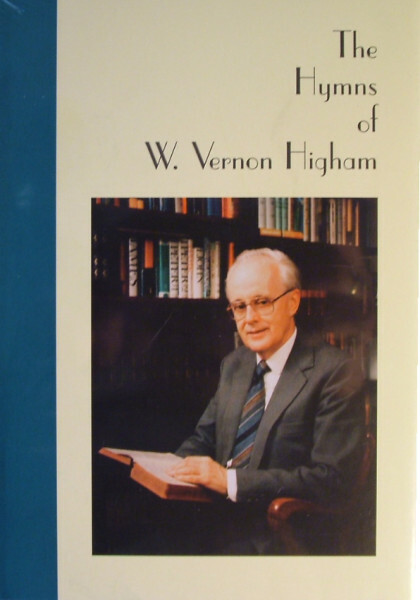 Beautifully produced, it contains all the English hymns from W. Vernon Higham’s previously published hymn-books plus an additional twenty-two. The volume is enriched by the author’s personal testimony as an introduction. The book is divided into twelve sections. Four lovely wedding hymns are included. Each hymn is based on a Scripture text, but some have the bonus of being akin to paraphrases of Scripture, for example, No.93 on Isaiah 64. Others touch on themes not well covered in other hymn-books, such as No.148 on the rainbow, No.100 on ‘What are these wounds in thine hands?’ and No 28 on the great white throne. There is a wide variety of metres and suggested tunes for each hymn. These hymns satisfy, not merely because of the beauty of their poetry, but because they are Christ-centred and experimental, expressing in scriptural language the fears and failures, longings and aspirations of the children of God. They often convey that childlike simplicity, characteristic of the Lord’s choicest believers, and a delight in the wonders of sovereign, electing grace. If ‘Great is the gospel of our glorious God’ and ‘I saw a new vision of Jesus’ are already established among your favourites, then these hymns can only provide further blessing. They stimulate us all to cry to God to make heavenly things more real and precious to us in these difficult days. — Anthony Williams in Evangelical Times. There is a timelessness about Mr Higham’s hymns because they express eternal truths and reflect the deepest desires and concerns of believers. Like Josph Hart, one of the greatest of all hymn-writers, Mr Higham has prefaced this collection with an account of his own spiritual experience. This gives value to the book. It explains something of the quality of the work which reflects a deep experience of the grace of God. Mr Higham’s own life is seen to underlie his deep desire for revival. Future hymn book compilers will be able to quarry from its resources. It immediate and widest value, however, will be as a devotional manual. Those who use it thus will be enriched. — Robert Oliver, in Evangelicals Now.